Mystic Cave 2P Reversed and Extended! Now on IB too! 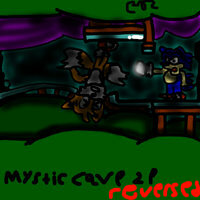 I decided to also put Mystic Cave 2P reversed and extended from my Youtube channel to IB also! In the picture, Sonic is trying to save Tails, who has opposite gravity from falling down!